When you’re first setting up a new kitchen, or looking to upgrade one of your older appliances, most things are relatively simple. Coffee makers, can openers, toasters, etc. But if you are one who does a lot of baking or mixing, one of the most important items in your kitchen arsenal is the stand mixer. Now that can be difficult to navigate. Some of the technical jargon surrounding them? Which features will make or break your bake? Which features are just unnecessary gimmicks, designed to drain your wallet? In this article, we’ll shed some light on some mixer terms, as well as which features are best for different kitchen applications. Let’s get in the mix! If you’ve been eye-balling mixers for any length of time, no doubt you’ve noticed the two main varieties: tilt head and bowl lift. Just as the names imply, a tilt-head mixer’s head will tilt back, allowing the user to insert or remove mixing attachments. A bowl-lift model has a stationary motor housing. The bowl has clamps that allow it to be moved up and down, for changing attachments and to access the bowl contents. Tilt-head models are usually shorter than bowl-lifts, simply because there does not need to be any extra height, to allow for the bowl to move up and down. This could be an important consideration if you plan to store the mixer in a cabinet when not in use. Why would anyone want a bowl-lift over a tilt-head? The main reason bowl-lifts require a fixed head is simply because of the weight of the motor – they are typically larger and more powerful than tilt-head motors, and having such weight at the top of the appliance presents a risk due to a high center of gravity. Tilting a motor like that back could cause the entire appliance to fall over! So if you are a heavy user, planning on making a lot of thick dough, a bowl-lift mixer may be the best choice. We all have AC electrical outlets in our homes. In the US, power comes to us at 110 volts, while most of the rest of the world receives power at 220 or 240 volts from the outlet. If you live outside of the US, it may be necessary to buy an adapter to convert the electricity to a form that won’t fry your new appliance. However, in many countries the appliance is wired for your voltage, and plugs. However, this is all still alternating current – AC. The most serious kitchen mixers will use direct current, or DC. These mixers will include a power inverter, usually inside the motor housing. This converts AC from the outlet into DC that the mixer can use, so there’s no need to worry about purchasing an adapter for that alone. However, this also adds to the weight of the appliance. One of the main benefits of a DC mixer is stronger torque. Torque??? This means the motor will be able to push through thick substances, like dough without breaking much of a sweat. DC mixers are also quieter and more efficient than AC motors, but usually larger and heavier as well. To further complicate things, this is not a spec usually listed on product descriptions, so you will be left to determine by looking at reviews, and/or the manual, whether the mixer runs on AC or DC. Fortunately, this is not too difficult to determine. The rule of thumb is that the larger, heavier, more expensive mixers will usually run on DC. Returning to the earlier discussion on AC vs DC, wattage is another spec that may confuse consumers. Since AC motors are less efficient, it would be inaccurate to compare a 300-watt AC mixer to a 300-watt DC mixer. DC mixers can provide much more reliable torque, are quieter, and will perform better overall than an AC mixer at the same wattage. Obviously, to cut costs, cheaper mixers will be constructed mostly out of plastic. It’s simply cheaper than metal. 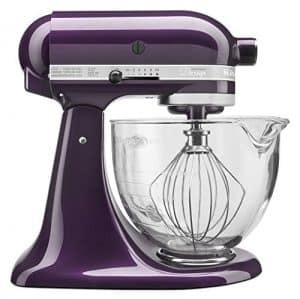 This also makes the mixer more lightweight, but less sturdy, so don’t expect to mix anything thicker than cookie dough or cake batter on these units. Higher-end mixers will be made out of both metal and plastic, or sometimes entirely metal. This provides the most durability and sturdiness but can add quite a bit of weight. One of the most common problems that consumers lament, in their reviews of mixers, and one of the most important questions, is whether the mixing attachments actually reach the bottom of the bowl. Few things are more frustrating than adding all of your ingredients together, only to get an inconsistent mix, because the bottom inch of the mixing bowl was left untouched. To remedy this problem, a good mixer will have an adjustment knob or screw that allows you to adjust the height of the mixing attachments. Specific instructions may vary from mixer to mixer, but the procedure generally involves placing a coin, such as a dime, in the bowl, and adjusting the height until the coin moves only ¼” to ½” per rotation. This provides just the right amount of clearance to get good mixing while not scratching up your bowl or damaging the attachments. Speaking of attachments, you may be wondering what the different attachments are? What they are for? Which are essential? We won’t go into an exhaustive list, as we will have another article that covers accessories in detail. But we will cover the main ones you are likely to find included with a decent mainstream stand mixer. The whisk attachment is used for incorporating air into a mixture that is intended to be fluffy. Think whipped cream, pancake batter, or scrambled eggs. Some mixers use two whisks side by side. Since the aim is for the mixture to be light and airy, the whisk is usually run at high speed. The flat beater is used for thicker mixtures like mashed potatoes, cake batter, and cookie dough. With a thicker mixture, it should be run at a slower speed, to avoid putting too much strain on the motor. The dough hook is for thicker yeast-based dough, where it saves you from hand-kneading. This is essential if you frequently make your own bread or pasta. Run this at lower speeds. Some mixers come with an additional attachment port that allows the use of shredders, grinders, and spiralizers. In fact these days, there are attachments to cover almost anything! These probably aren’t essential for the casual user, but for someone who wants one appliance to handle almost all of their food prep needs, this is a worthwhile consideration, and can be a great space saver. Planetary mixing is where the mixing attachment, rather than rotating on a single axis, incorporates multiple vertical axes and can therefore reach more of the space inside the bowl to provide better mixing. As you can tell, there is a lot to consider before buying a new mixer for your kitchen. This single appliance has the potential to be the centerpiece of your kitchen! The tool that gets the most use out of everything else in your culinary arsenal! While the cheaper hand mixers have their place in the kitchen, if baking is a significant part of your repertoire, then a high quality stand mixer is essential! So don’t short yourself and your diners, by making an uninformed decision, purchasing the wrong mixer for your needs!